It was just another all-Saturday wrestling tournament. Jeff Wilson was there to watch his oldest child, Phillip, a junior at Springfield High School, compete. Looking back at that day, Jeff doesn’t recall anything out of the ordinary. He took Phillip home, and his son slept all night. And the next day. And the next. They had to rouse him to get him to eat. His parents thought it was exhaustion or maybe a touch of the flu. Phillip felt better on Tuesday but started having headaches at school. He talked to Karen Gregory, a SportsCare athletic trainer based at Springfield High, about it. She called Jeff and suggested his son be evaluated for a concussion. Using ImPACT™, a computerized concussion evaluation system, SportsCare was able to test Phillip that week, compare his results to an earlier baseline test and confirm that a concussion was the probable cause. Every year, tens of thousands of high-school athletes sustain concussions. Often, athletes are not aware they’ve had a serious head injury or are reluctant to mention it out of fear that they’ll be pulled from games. As for Phillip, everything’s back to normal as he prepares to start his senior year at Springfield High. He was out of wrestling for two weeks to give his head time to recover from its injury. 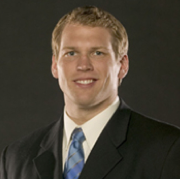 Chris Nowinski, a former Harvard football player and WWE professional wrestler, will be the featured speaker at this year’s SportsCare annual Guerry and Michelle Suggs sports medicine symposium on Friday, Aug. 5, in the hospital’s Wedeberg Conference Center. Today, Nowinski is co-founder and president of the Sports Legacy Institute, a nonprofit organization dedicated to solving the sports concussion crisis. If you want more details, visit MemorialSportsCare.com or call 217-862-0444.